This guide will help you troubleshoot why you are not getting the Alert emails you expect from SharePoint. There are a multitude of problems and we can’t possibly cover every possibility here, but following this guide should help you resolve the most common problems. The wild cards in this process are spam filters and email client processing rules (e.g. file anything that comes from this address or with this subject in this folder) – so it’s worth ruling those out before going any further. 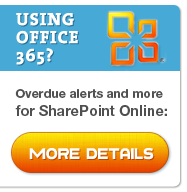 Are you getting any emails from SharePoint? The first stage is to determine if the problems are caused by SharePoint or other parts of your email infrastructure. When you setup an email alert you receive an immediate “You have successfully created an alert for…” confirmation email. If you do not receive this then continue with this guide, its likely that the problem is not within SharePoint, but some other part of your email infrastructure. then we know that the email infrastructure is setup correctly and any further problems are to do with SharePoint. That this user’s email is being delivered successfully from other sources? And are running a server farm then you may have a problem with the configuration of one of the servers in your farm so continue with the “you do not receive this email” section, applying the troubleshooting steps to the servers individually where appropriate. Check the email settings in SharePoint central administration are correct (SharePoint Central Administration > Operations > Outgoing Emails Settings) – note the Outbound SMTP server, From and Reply To addresses. Remember that if your security blocks SMTP transmissions based on process or account then test tools such as Telnet or SMTP Test tool will be a different process and will often be running under a different account to SharePoint. Does the SMTP server permit connections (relay’s) from your SharePoint servers – including all the Web Front Ends (WFE) and Index server? Is the SMTP server configured to deliver emails or relay them to another SMTP server and is it working? Does your SMTP server require a username/password or SSL? In which case you will have to install something like Windows IIS SMTP server (locally on or another server), set SharePoint to deliver emails to this and then deliver emails directly or relay those emails onto your main SMTP server. This guide shows how you would set IIS SMTP server to relay messages from SharePoint to smtp.google.com as an example.